Creates and initializes the LLFloaterAvatarList Here the interface is created, and callbacks are initialized. Updates the internal avatar list with the currently present avatars. Returns TRUE if the avatar is in the list of known avatars. Returns the entry for an avatar, if preset. Requests a TrustNet score from the Adapter. Requests information about the avatar from the database. Returns a string with the selected names in the list. Toggles interface visibility There is only one instance of the avatar scanner at any time. Process the reply to a request for avatar properties. Handles IM messages to process the ones that are replies to database requests. Process a reply from the TrustNet Adapter This handles replies from the TrustNet adapter, such as score results. Removes focus status from all avatars in list. Focus camera on previous avatar. Focus camera on next avatar. Cleanup avatar list, removing dead entries from it. This lets dead entries remain for some time. This makes it possible to keep people passing by in the list long enough that it's possible to do something to them. Perform a Luskwood Gohomer command on the selected users. Process the AR queue This generates AR reports for the queued avatars. Request information about the specified avatar. Returns the color for the specified avatar entry. Handler for the "refresh" button click. I am unsure whether this is actually necessary at the time. Handle the results of a gohomer confirmation dialog. Handle the results of a gohomer turn off dialog. Pointer to the avatar scroll list. List of AR screens opened We don't open them on creation to capture a clean screenshot. They're opened only after finishing the process. Last time during which an AR was submitted Used to give the camera some time to move between avatars. Perhaps this way of doing things isn't ideal, though. Used to delay avatar data requests. Used to delay trustnet requests. Avatar the camera is focused on. Avatar List Implements an avatar scanner in the client. This is my first attempt to modify the SL source. This code is intended to have a dual purpose: doing the task, and providing an example of how to do it. For that reason, it's going to be commented as exhaustively as possible. Since I'm very new to C++ any suggestions on coding, style, etc are very welcome. Definition at line 498 of file llfloateravatarlist.h. Definition at line 603 of file llfloateravatarlist.h. Definition at line 592 of file llfloateravatarlist.h. Definition at line 236 of file llfloateravatarlist.cpp. References LLMessageSystem::addHandlerFunc(), LLUICtrlFactory::buildFloater(), LLPanel::childSetAction(), FALSE, LLUICtrlFactory::getScrollListByName(), gMessageSystem, gUICtrlFactory, mARLastFrame, mAvatarList, mDataRequestTimer, mTrackByLocation, mTracking, onClickAR(), onClickEject(), onClickEjectFromEstate(), onClickFreeze(), onClickGetKey(), onClickGohomerEject(), onClickGohomerOff(), onClickGohomerSendAway(), onClickGohomerSendHome(), onClickGohomerSendHomeByKey(), onClickGohomerWarn(), onClickIM(), onClickMark(), onClickMute(), onClickNextInList(), onClickNextMarked(), onClickPrevInList(), onClickPrevMarked(), onClickProfile(), onClickTeleport(), onClickTrack(), onClickTrustNetExplain(), onClickTrustNetGetPassword(), onClickTrustNetRate(), onClickTrustNetRenew(), onClickTrustNetWebsite(), onDoubleClick(), processAvatarPropertiesReply(), refreshAvatarList(), LLUICtrl::setCallbackUserData(), LLPanel::setDefaultBtn(), LLScrollListCtrl::setDoubleClickCallback(), LLFloater::setVisible(), LLScrollListCtrl::sortByColumn(), LLTimer::start(), and TRUE. Definition at line 302 of file llfloateravatarlist.cpp. References LLMessageSystem::delHandlerFunc(), gMessageSystem, and processAvatarPropertiesReply(). Definition at line 1011 of file llfloateravatarlist.cpp. Definition at line 1781 of file llfloateravatarlist.cpp. References cmd_ban(), cmd_eject(), and doCommand(). Definition at line 1809 of file llfloateravatarlist.cpp. References cmd_estate_ban(), cmd_estate_eject(), and doCommand(). Definition at line 1767 of file llfloateravatarlist.cpp. References cmd_freeze(), cmd_unfreeze(), and doCommand(). Definition at line 1795 of file llfloateravatarlist.cpp. References cmd_mute(), cmd_unmute(), and doCommand(). Definition at line 978 of file llfloateravatarlist.cpp. References FALSE, LLTracker::getTrackedPositionGlobal(), llendl, llinfos, mAvatars, mTrackByLocation, mTrackedAvatar, mTracking, NULL, LLTracker::stopTracking(), LLTracker::trackLocation(), and TRUE. Referenced by callbackEject(), callbackEjectFromEstate(), callbackFreeze(), callbackMute(), and onClickProfile(). Definition at line 470 of file llfloateravatarlist.cpp. References ACTIVITY_DEAD, CLEANUP_TIMEOUT, llendl, llinfos, and mAvatars. Definition at line 1463 of file llfloateravatarlist.cpp. References CAMERA_POSITION_OBJECT, FALSE, first, gAgent, LLAvatarListEntry::getID(), LLAvatarListEntry::isDead(), LLAvatarListEntry::isMarked(), LLAgent::lookAtObject(), mAvatars, mFocusedAvatar, NULL, removeFocusFromAll(), LLAvatarListEntry::setFocus(), and TRUE. Definition at line 1421 of file llfloateravatarlist.cpp. References CAMERA_POSITION_OBJECT, gAgent, LLAvatarListEntry::getID(), LLAvatarListEntry::isDead(), LLAvatarListEntry::isMarked(), LLAgent::lookAtObject(), mAvatars, mFocusedAvatar, NULL, removeFocusFromAll(), LLAvatarListEntry::setFocus(), and TRUE. Definition at line 1311 of file llfloateravatarlist.cpp. References a, b, LLColor4::black, CT_AGE, CT_DISTANCE, CT_NONE, CT_PAYMENT, CT_SCORE, DATA_RETRIEVED, f, g, LLAvatarInfo::getAge(), LLAvatarListDatum< T >::getStatus(), LLAvatarListDatum< T >::getValue(), LLAvatarListEntry::mAvatarInfo, LLAvatarListEntry::mTrustNetScore, r, S32, and LLAvListTrustNetScore::Score. Pointer to avatar entry, NULL if not found. Definition at line 1016 of file llfloateravatarlist.cpp. References LLUUID::isNull(), mAvatars, and NULL. Referenced by addParticleSourcesToList(), getSelectedNames(), luskwoodCommand(), onClickMark(), onClickTeleport(), LLPipeline::postSort(), processTrustNetReply(), and LLAgent::startTyping(). Definition at line 1747 of file llfloateravatarlist.cpp. References getAvatarEntry(), LLAvatarListEntry::getName(), LLScrollListCtrl::getSelectedIDs(), mAvatarList, and NULL. 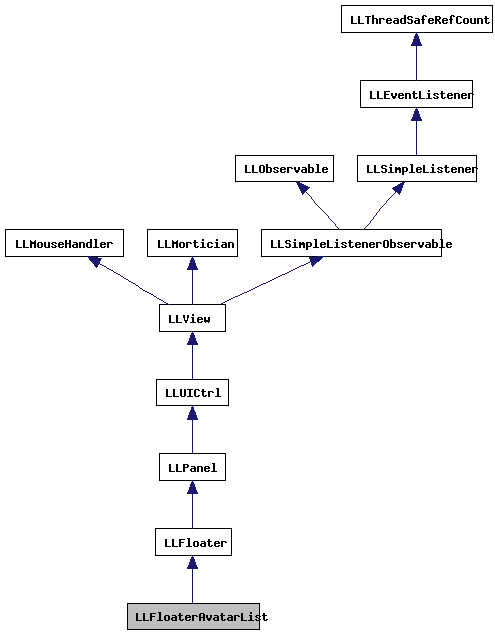 Definition at line 1115 of file llfloateravatarlist.cpp. References LLMiscDBInfo::data, FALSE, LLControlGroup::getString(), gFloaterAvatarList, gSavedPerAccountSettings, llendl, llinfos, mAvatars, LLUUID::set(), and TRUE. Definition at line 1238 of file llfloateravatarlist.cpp. Referenced by onClickGohomerEject(), onClickGohomerSendAway(), onClickGohomerSendHome(), onClickGohomerSendHomeByKey(), and onClickGohomerWarn(). Definition at line 1247 of file llfloateravatarlist.cpp. Definition at line 1204 of file llfloateravatarlist.cpp. References LLUUID::asString(), CHAT_TYPE_SHOUT, getAvatarEntry(), LLAvatarListEntry::getID(), LLAvatarListEntry::getName(), LLScrollListCtrl::getSelectedIDs(), mAvatarList, NULL, and speakText(). Definition at line 1857 of file llfloateravatarlist.cpp. References LLScrollListCtrl::getSelectedIDs(), llendl, llinfos, mARQueue, and mAvatarList. Definition at line 1831 of file llfloateravatarlist.cpp. References LLViewerWindow::alertXml(), callbackEject(), and gViewerWindow. Definition at line 1847 of file llfloateravatarlist.cpp. References LLViewerWindow::alertXml(), callbackEjectFromEstate(), and gViewerWindow. Definition at line 1823 of file llfloateravatarlist.cpp. References LLViewerWindow::alertXml(), callbackFreeze(), and gViewerWindow. Definition at line 1584 of file llfloateravatarlist.cpp. References LLWindow::copyTextToClipboard(), LLScrollListItem::getUUID(), gViewerWindow, LLViewerWindow::mWindow, NULL, LLUUID::toString(), utf8str_to_wstring(), and UUID_STR_LENGTH. Definition at line 1267 of file llfloateravatarlist.cpp. References LLViewerWindow::alertXml(), gViewerWindow, and handleLuskwoodDialog(). Definition at line 1304 of file llfloateravatarlist.cpp. References LLViewerWindow::alertXml(), gViewerWindow, and handleLuskwoodGohomerOffDialog(). Definition at line 1276 of file llfloateravatarlist.cpp. Definition at line 1285 of file llfloateravatarlist.cpp. Definition at line 1294 of file llfloateravatarlist.cpp. Definition at line 1257 of file llfloateravatarlist.cpp. Definition at line 788 of file llfloateravatarlist.cpp. References LLIMMgr::addSession(), LLUUID::generate(), LLScrollListCtrl::getSelectedIDs(), gIMMgr, IM_NOTHING_SPECIAL, IM_SESSION_CONFERENCE_START, mAvatarList, mAvatars, MAX_STRING, LLIMMgr::setFloaterOpen(), and TRUE. Definition at line 1222 of file llfloateravatarlist.cpp. References getAvatarEntry(), LLScrollListCtrl::getSelectedIDs(), mAvatarList, NULL, and LLAvatarListEntry::toggleMark(). Definition at line 1839 of file llfloateravatarlist.cpp. References LLViewerWindow::alertXml(), callbackMute(), and gViewerWindow. Definition at line 1520 of file llfloateravatarlist.cpp. Definition at line 1534 of file llfloateravatarlist.cpp. Definition at line 1513 of file llfloateravatarlist.cpp. Definition at line 1527 of file llfloateravatarlist.cpp. Definition at line 1871 of file llfloateravatarlist.cpp. Definition at line 1878 of file llfloateravatarlist.cpp. References gAgent, getAvatarEntry(), LLScrollListCtrl::getFirstSelected(), LLAvatarListEntry::getName(), LLAvatarListEntry::getPosition(), LLScrollListItem::getUUID(), llendl, llinfos, mAvatarList, and LLAgent::teleportViaLocation(). Definition at line 820 of file llfloateravatarlist.cpp. 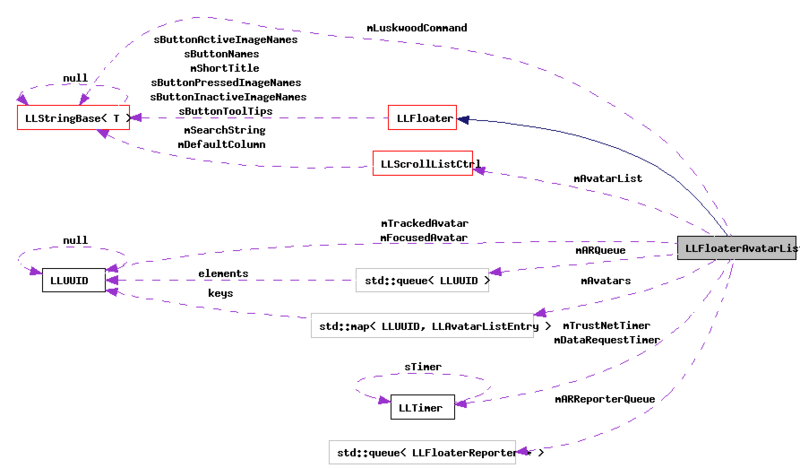 References FALSE, LLScrollListCtrl::getFirstSelected(), LLScrollListItem::getUUID(), mAvatarList, mAvatars, mTrackByLocation, mTrackedAvatar, mTracking, NULL, LLTracker::stopTracking(), LLTracker::trackAvatar(), and TRUE. Definition at line 1548 of file llfloateravatarlist.cpp. References LLUUID::asString(), CHAT_TYPE_WHISPER, LLAvatarListEntry::getID(), LLAvatarListEntry::getName(), LLScrollListItem::getUUID(), NULL, and TRUSTNET_CHANNEL. Definition at line 1569 of file llfloateravatarlist.cpp. Definition at line 1541 of file llfloateravatarlist.cpp. Definition at line 1577 of file llfloateravatarlist.cpp. Definition at line 1561 of file llfloateravatarlist.cpp. Definition at line 513 of file llfloateravatarlist.h. Definition at line 1401 of file llfloateravatarlist.cpp. References CAMERA_POSITION_OBJECT, gAgent, LLScrollListItem::getUUID(), and LLAgent::lookAtObject(). Definition at line 428 of file llfloateravatarlist.cpp. References CAMERA_POSITION_OBJECT, FALSE, gAgent, gFrameCount, LLAgent::lookAtObject(), mARLastFrame, mARQueue, mARReporterQueue, r, LLFloater::setMinimized(), LLFloaterReporter::showFromObject(), and TRUE. Definition at line 860 of file llfloateravatarlist.cpp. References _PREHASH_AgentData, _PREHASH_AgentID, _PREHASH_AvatarID, _PREHASH_BornOn, _PREHASH_Flags, _PREHASH_PropertiesData, LLAvatarInfo::Account, ACCOUNT_CHARTER_MEMBER, ACCOUNT_EMPLOYEE, ACCOUNT_RESIDENT, ACCOUNT_TRIAL, AVATAR_IDENTIFIED, AVATAR_TRANSACTED, LLAvatarInfo::BirthDate, DB_BORN_BUF_SIZE, FALSE, LLMessageSystem::getBinaryData(), LLMessageSystem::getSize(), LLMessageSystem::getString(), LLMessageSystem::getStringFast(), LLMessageSystem::getU32Fast(), LLMessageSystem::getUUIDFast(), gFloaterAvatarList, llclamp(), llendl, llwarns, LLAvatarListEntry::mAvatarInfo, mAvatars, MAX_STRING, NULL, LLAvatarInfo::Payment, PAYMENT_LINDEN, PAYMENT_NONE, PAYMENT_ON_FILE, PAYMENT_USED, S32, LLAvatarListEntry::setAccountCustomTitle(), and LLAvatarListDatum< T >::setValue(). Referenced by LLFloaterAvatarList(), and ~LLFloaterAvatarList(). Definition at line 1147 of file llfloateravatarlist.cpp. References LLWindow::copyTextToClipboard(), count, LLWeb::escapeURL(), getAvatarEntry(), gFloaterAvatarList, gViewerWindow, llendl, llformat(), llinfos, llwarns, LLWeb::loadURL(), LLAvatarListEntry::mTrustNetScore, LLViewerWindow::mWindow, NULL, s, LLAvatarListDatum< T >::setValue(), type, and utf8str_to_wstring(). Redraws the avatar list Only does anything if the avatar list is visible. Definition at line 506 of file llfloateravatarlist.cpp. References ACTIVITY_DEAD, ACTIVITY_GESTURING, ACTIVITY_MOVING, ACTIVITY_NEW, ACTIVITY_NONE, ACTIVITY_PARTICLES, ACTIVITY_REZZING, ACTIVITY_SOUND, ACTIVITY_TYPING, ADD_BOTTOM, LLScrollListCtrl::addElement(), CT_AGE, CT_DISTANCE, CT_SCORE, LLColor4::cyan, DATA_ERROR, DATA_REQUESTING, DATA_RETRIEVED, DATA_UNKNOWN, LLScrollListCtrl::deleteAllItems(), FALSE, gAgent, LLAvatarListEntry::getActivity(), LLAvatarInfo::getAge(), getAvatarColor(), LLControlGroup::getBOOL(), LLUICtrlFactory::getCheckBoxByName(), LLAvatarListEntry::getID(), LLAvatarListEntry::getIsLinden(), LLAvatarListEntry::getName(), LLAvatarListEntry::getPosition(), LLAgent::getPositionGlobal(), LLScrollListCtrl::getScrollPos(), LLScrollListCtrl::getSelectedIDs(), LLAvatarListDatum< T >::getStatus(), LLControlGroup::getString(), LLColor4::getValue(), LLUICtrl::getValue(), LLAvatarListDatum< T >::getValue(), gSavedPerAccountSettings, gSavedSettings, gViewerArt, LLAvatarListEntry::isDead(), LLAvatarListEntry::isFocused(), LLAvatarListEntry::isMarked(), LLUUID::isNull(), LIST_ACTIVITY, LIST_AGE, LIST_AVATAR_ICON, LIST_AVATAR_NAME, LIST_DISTANCE, LIST_PAYMENT, LIST_SCORE, LLCheckboxCtrl, llendl, llinfos, llwarns, LLVector3d::magVec(), LLAvatarListEntry::mAvatarInfo, mAvatarList, mAvatars, LLAvatarListEntry::mMiscInfo, LLAvatarListEntry::mTrustNetScore, NULL, LLAvatarInfo::Payment, PAYMENT_LINDEN, PAYMENT_NONE, PAYMENT_ON_FILE, PAYMENT_USED, LLAvatarListDatum< T >::requestIfNeeded(), requestMiscInfo(), requestTrustNetScore(), S32, LLAvListTrustNetScore::Score, LLScrollListCtrl::selectMultiple(), sendAvatarPropertiesRequest(), LLScrollListCtrl::setScrollPos(), LLScrollListCtrl::sort(), and visible(). Referenced by LLFloaterAvatarList(), and updateAvatarList(). Definition at line 1410 of file llfloateravatarlist.cpp. Referenced by focusOnNext(), and focusOnPrev(). Definition at line 1070 of file llfloateravatarlist.cpp. References FALSE, i, size, LLUUID::toString(), TRUE, and UUID_STR_LENGTH. Definition at line 1098 of file llfloateravatarlist.cpp. References LLControlGroup::getString(), gSavedPerAccountSettings, llendl, llinfos, replaceVars(), send_simple_im(), and LLUUID::set(). Definition at line 1060 of file llfloateravatarlist.cpp. References CHAT_TYPE_WHISPER, speakText(), LLUUID::toString(), TRUSTNET_CHANNEL, type, and UUID_STR_LENGTH. Definition at line 842 of file llfloateravatarlist.cpp. References _PREHASH_AgentData, _PREHASH_AgentID, _PREHASH_AvatarID, _PREHASH_AvatarPropertiesRequest, _PREHASH_SessionID, LLMessageSystem::addUUIDFast(), gAgent, LLAgent::getID(), LLAgent::getSessionID(), gMessageSystem, lldebugs, llendl, mAvatars, LLMessageSystem::newMessageFast(), LLMessageSystem::nextBlockFast(), and LLAgent::sendReliableMessage(). Definition at line 312 of file llfloateravatarlist.cpp. Definition at line 1041 of file llfloateravatarlist.cpp. References _PREHASH_AgentData, _PREHASH_AgentID, _PREHASH_ChatData, _PREHASH_ChatFromViewer, _PREHASH_Message, _PREHASH_SessionID, _PREHASH_Type, LLMessageSystem::addS32(), LLMessageSystem::addStringFast(), LLMessageSystem::addU8Fast(), LLMessageSystem::addUUIDFast(), gAgent, LLAgent::getID(), LLAgent::getSessionID(), gMessageSystem, gViewerStats, LLViewerStats::incStat(), LLMessageSystem::newMessageFast(), LLMessageSystem::nextBlockFast(), LLAgent::sendReliableMessage(), and LLViewerStats::ST_CHAT_COUNT. Referenced by luskwoodCommand(), and requestTrustNetScore(). Definition at line 319 of file llfloateravatarlist.cpp. References LLFloater::close(), LLView::getVisible(), gFloaterAvatarList, llendl, llinfos, and show(). Referenced by LLShowFloater::handleEvent(), and LLToolBar::onClickAvatarList(). Definition at line 342 of file llfloateravatarlist.cpp. References checkTrackingStatus(), expireAvatarList(), gAgent, LLUICtrlFactory::getCheckBoxByName(), LLAgent::getPosGlobalFromAgent(), LLUUID::isNull(), LLCheckboxCtrl, llendl, llinfos, mAvatars, processARQueue(), refreshAvatarList(), and LLCharacter::sInstances. Definition at line 336 of file llfloateravatarlist.cpp. Definition at line 740 of file llfloateravatarlist.h. Referenced by LLFloaterAvatarList(), and processARQueue(). Definition at line 726 of file llfloateravatarlist.h. Referenced by onClickAR(), and processARQueue(). Definition at line 733 of file llfloateravatarlist.h. Definition at line 720 of file llfloateravatarlist.h. Referenced by getSelectedNames(), LLFloaterAvatarList(), luskwoodCommand(), onClickAR(), onClickIM(), onClickMark(), onClickTeleport(), onClickTrack(), and refreshAvatarList(). Definition at line 721 of file llfloateravatarlist.h. Referenced by avatarIsInList(), checkTrackingStatus(), expireAvatarList(), focusOnNext(), focusOnPrev(), getAvatarEntry(), handleIM(), onClickIM(), onClickTrack(), processAvatarPropertiesReply(), refreshAvatarList(), removeFocusFromAll(), sendAvatarPropertiesRequest(), and updateAvatarList(). Definition at line 775 of file llfloateravatarlist.h. Definition at line 790 of file llfloateravatarlist.h. Definition at line 785 of file llfloateravatarlist.h. Definition at line 769 of file llfloateravatarlist.h. Referenced by checkTrackingStatus(), LLFloaterAvatarList(), and onClickTrack(). Definition at line 770 of file llfloateravatarlist.h. Referenced by checkTrackingStatus(), and onClickTrack(). Definition at line 768 of file llfloateravatarlist.h. Definition at line 780 of file llfloateravatarlist.h.